Just stop procrastinating & introduce myself! i'm debra and i have kirby and la la la. welcome to the team. you and marcia can jump in any time to our daily chat at "a special place to meet" . colette has joined in. just say hi and go from there. we're a bunch of people who love to talk about the adventures of our westies while we share this lifestyle journey. Hi my name is Julie and its time to get back on the road and get where I was before. I just had a total knee replacement and am in the process of healing. So am hoping to start my exercising in the next few months but have decided to start watching my calories from today on. Welcome to the team Marcia!. Hi everyone! I just joined Spark in January but really think it's a great website. Becky was nice enough to send me a invitation to join the team. We owned a Westie quite a few years ago but I still love the breed and get excited every time I'm lucky to spot one out and about. My dream is to have another one some day. In the meantime, I still keep little Westie collectibles around the house. Wishing you a great week and looking forward to participating with all of you. Looks like a great team! Welcome, i live just outside San Francisco with my husband and our two westies Jess (4) and Bluey (3). We moved here from England in November 2009. Well hello Colette!! I can speak for the team to say that we are so glad you decided to stop procrastinating and introduce yourself!! LOL!! We are VERY glad that you found us and that you have chosen to participate with this team! It is so nice! My name is Becky. I live by Lake Oroville in No. Calif. Buddy is our Westie who will soon be 4. DH and I successfully joined two families together making 8 children. All our children are grown and making own their way in life. We now have 10 grandchildren. DH and I watch the youngest granddaughter, Hadleigh, 3 days a week. She is just 1 and walking all over the place. I hope that all the chasing I have to do will help me get thin (again). I'm Colette from the Lehigh Valley in PA. I have 4 children, all who I am lucky enough to see almost everyday. My two sons live at home & have jobs, but one of them doesn't drive. So I either drive him or coordinate car rides. My youngest Michaela is a junior in high school. She needs a ride to school and back. My daughter Stacianne (Kindergarten teacher) has two girls, and I babysit them Mon-Fri 7:30 to 4:00 or 5:15 (since they were 6 weeks old). In the summer, sometimes Saturday mornings, too. Kaysiana is 5 years old and goes to preschool, so that's two rides at 12:00 and 2:45. Needless to say, I'm in the car alot. And when the girls go home, sometimes I take a nap. We got him in April when our Scoobee ( a black lab/rottweiler mix) had to be put to sleep last March (14 yrs old). Her legs were giving out. We went pretty long, hoping for a miracle. This, in the middle of winter. She had to be carried down steps to the backyard. The steps are wooden, but our front steps are concrete. For some reason, she would attempt those. Then we had to shovel a path from the front to the back yard. Scoobee's habit was great most of the time. She would only pee in our back yard. We could take her for a walk and she would never pee/poop. Nice for us, as well as the neighbor's property. I said most. We took a visit overnight to my SIL's house, and Scoobee would not pee on any walks. We crated her overnight, and that morning she peed on the kitchen floor, because my husband wasn't fast enough in getting her out the door. That's it. Nothing until we got home (about 45 hours total - 1pee). We also had another dog, Lily, a tri-color Pomeranian. Last October (on my birthday), my son found her dead in her crate before he went to work. We have no idea why. She was hopping around the night before. She had just turned 8, and was just training Jake. They were cute together, because he wasn't full grown yet. At some point, we hope to get another dog to be a buddy to Jake (Jakester on his papers), but our family is going to Disney at the end of June, so it is probably better to wait. Saves on the boarding, too. 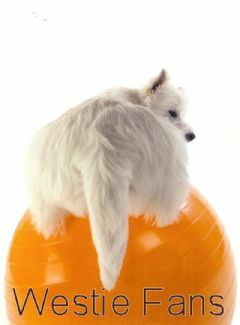 But I keep looking on the internet at other Westies, expecially since I joined this group.